Home Where’s the Great Wave? The Honolulu Museum of Art is committed to offering visitors a comprehensive understanding of our collection of Japanese prints, which is the third largest in the United States. The woodblock prints in this gallery are rotated every two months, ensuring that even frequent visitors always see new things. In addition, the museum displays images and details about those works in its online database. The frequency of our print rotations also protects the artwork. Japanese works on paper are particularly sensitive to environmental changes, so they are displayed in climate-controlled galleries, where temperature, relative humidity, and light levels are carefully regulated. Still, when on view, the prints are exposed to ultraviolet radiation, and, as a result, the vegetable-based pigments used in the prints gradually fade. To delay these changes, we store the prints in complete darkness for several months after each exhibition. So if you don’t see important, popular works from our Japanese woodblock print collection, such as The Great Wave off the Coast of Kanagawa by Katsushika Hokusai when you visit, it is because they are having a rest in our print vault to ensure its preservation for generations to come. We appreciate your understanding and support. Willing to wait for The Great Wave? It’s slated to go on view for HoMA’s centennial in 2027—so mark those calendars now! Katsushika Hokusai (1760–1849). The Great Wave off the Coast of Kanagawa, from the series Thirty-six Views of Mount Fuji. Japan, Edo period (1615–1868), 1832. Woodblock print. Ink and color on paper Gift of James A. Michener, 1955 (13695). 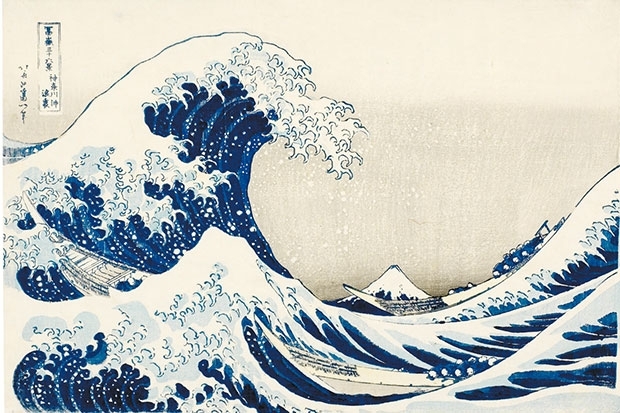 The Great Wave off the Coast of Kanagawa by Katsushika Hokusai is an amazing work of art that truly personifies the resiliency of the human spirit with a traditional and beautiful Japonese style. It was fasinating to learn about how they care for the prints and rotate them to preserve them. This exhibit is one that I truly would love to visit if given the chance!